Tropical Storm Julia forms along coast of Florida. MIAMI, FL -- Tropical Storm Julia has formed along the northeastern coast of Florida. The National Hurricane Center says the slow-moving storm is expected to bring heavy rain and possible flash flooding. A tropical storm warning was issued Tuesday night for Ponte Vera Beach north to the Altamaha Sound in Georgia. 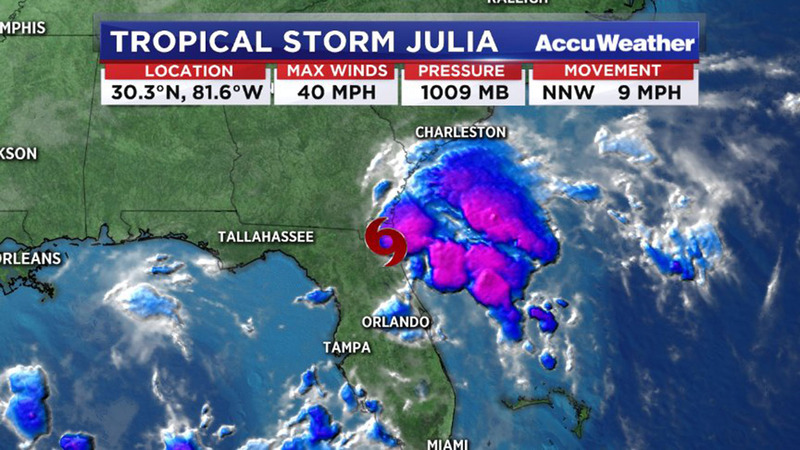 At 11 p.m. Tuesday, Julia was 5 miles (10 kilometers) west of Jacksonville and moving north-northwest at 9 mph (15 kph). It had maximum sustained winds of 40 mph (65 kph). The storm is expected to weaken to a tropical depression by late Wednesday. Elsewhere, Tropical Storm Ian has grown slightly stronger but still was no threat to land over the central Atlantic. In the Pacific, Hurricane Orlene continues to weaken, with maximum sustained winds of 85 mph (140 kph).